Évaluez cet Article Texas Hold 'Em is by a large margin, the most popular type of poker in the world, but when it comes down to the details, how much do you know about it? Let's find out! Texas Hold ‘Em Poker - it may just be one of the most popular games in the world, with a rich history and an even richer future. When it comes to playing poker, very little comes close to the gameplay dynamics and stakes that Texas Hold ‘Em offers. But where exactly did Texas Hold ‘Em come from, how does it differ from the standard game, and why do we love it so much? Where Did Texas Hold ‘Em Come From? Texas Hold ‘Em, as its name suggests, did actually start out in Texas. A small town named Robstown claims credit for the illustrious poker game that has swept the world, with a game started in the early 20th century. Up until 1967, the game was known as ‘hold ‘em’ and stayed local to Texas, a favorite among the Lone Star State's citizens. Moving the game to casino capital Las Vegas added its provenance of Texas, and the flurry of people visiting Sin City helped spread the influence of Texas Hold ‘Em far and wide. A tournament held in 1969 really put Hold ‘Em on the map when some high rollers found that the game could be financially rewarding. Its inclusion into the World Series of Poker helped keep Texas Hold ‘Em’s strong reputation as a game that, with no limits, could prove incredibly lucrative if players were skilled enough in the rules and strategies required to succeed. Texas Hold ‘Em is described as the ‘thinking man’s game’ due to the four bets required in the game, as opposed to standard draw poker’s two. By doubling the opportunities to bet, the game enabled players to plan strategically and think of their moves – and their opponents' moves – in a more logical and analytical way. This gameplay amendment is likely what caused the game to gain so much traction with high rollers and those interested in playing poker professionally. The game also changed aces from low to high, adding another element to the game that kept the dynamism of poker intact. The game's popularity continues today, with variations online, such as those available through 888poker, building upon the original gameplay. Texas Hold 'Em Poker is one of the most popular card games in the world. Texas Hold ‘Em was also more cinematically viable as a game than its equivalents of Omaha Hi-Lo and 7 Card Stud. Rounders (1998) starring Matt Damon and Edward Norton, and Casino Royale, the 2006 Daniel Craig reboot of the Bond films both featured Texas Hold ‘Em as a primary plot point. Coupled with the appeal of the films, and the way of life insinuated into the game, Texas Hold ‘Em became one of the most atmospheric and iconic casino games. Texas Hold ‘Em also received a huge boost in popularity from the success of poker player Chris Moneymaker (yes, real name!) Chris succeeded in winning the Main Event at the World Series of Poker in 2003 and won $2.5million as the dark horse of the competition. So far, he has accrued a massive $3,675,000 playing poker, and even released an autobiography as a poker manual for other players, explaining the strategies he used to succeed. 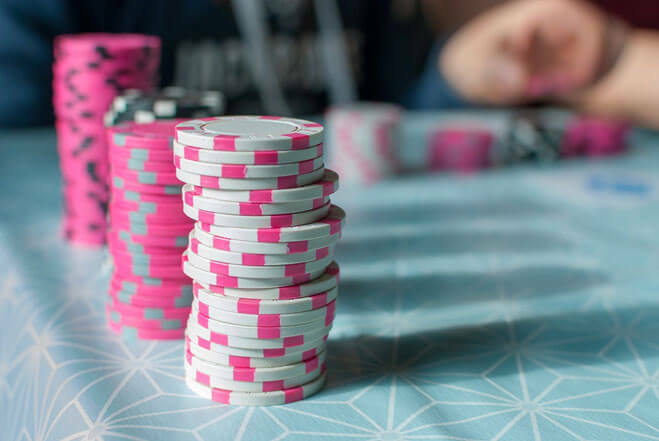 The Moneymaker effect of an online poker player becoming a WSOP winner fuelled the online poker craze, especially Texas Hold ‘Em, and helped to show that the game’s transferable skills in strategy and working under pressure combined to bring him his victory. How Do You Play Texas Hold ‘Em? The gameplay of Texas Hold ‘Em is straightforward as far as poker goes. Initially, players are dealt two cards face down, known as hole cards. A round of betting commences, where players can check, bet or fold. This is the pre-flop stage, and the hole cards determine what you should do. When the betting has ended, three shared cards are placed face up on the table, known as the flop. Another round of betting commences, and then a fourth shared card is dealt face up, the turn. Another round of betting and a fifth card is dealt onto the table, the river. And then this is followed by a final round of betting. A five card hand is made up of the two hole cards and three of the five shared cards. A hand can end in a showdown, in which players face off for the best hand, or through one player betting so much that the other players fold, not wanting to lose with what they may assume is a sure win. But, here is the strategic level of the game – players can bluff over what their hole cards may be. Some more impulsive players will attempt to have their opponents all fold, regardless of their chance of winning a showdown. Others may make the tactical decision depending on how the game progresses. The betting at each stage can also inform players as to whether opponents may have certain cards or be in certain positions. Ultimately, keeping your cards close to your chest and reading your opponents to see if they are bluffing or not is the best way to develop strategic thinking in Texas Hold ‘Em poker. 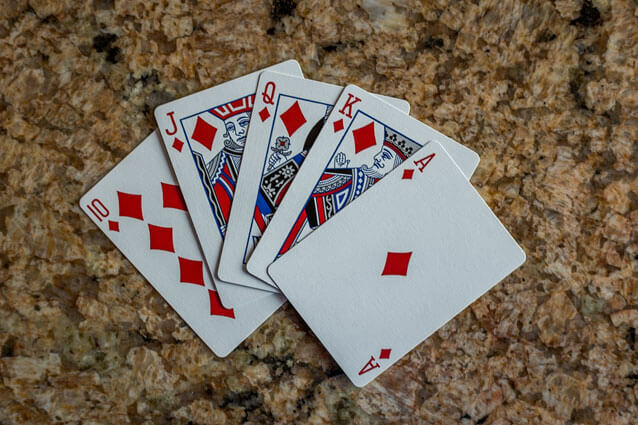 The best hands in Texas Hold ‘Em are the Royal Flush (10 to Ace in the same suit), Straight Flush (five sequential cards in the same suit) and the Four of a Kind (four of the same card, different suits) respectively. Full House comes next – which is comprised of a three of a kind and a pair, and then a flush, which is any cards of the same suit. Five cards in a sequence of mixed suits come next; this is known as a straight. Then it’s Three of a Kind, then Two Pair (two different pairs of cards) and then a Pair. If you haven’t made any of the winning hands, the highest card plays. The vast amount of combinations – and only having partial knowledge of an opponent’s hand - could derail your own strategy. Ultimately, it comes down to a combination of both strategic thinking from practicing poker and the ability to read opponents and ensure they can’t read you. Are There Variations of Texas Hold ‘Em? Variations can rely on the limit of betting available. For example, pot limit means bets can’t exceed the amount in the pot, while no limit allows any amount to be bet at any time in the game. There are no minimum or maximum bets with no limit, and players can even go ‘all in’, which can be either a calculated move or a completely reckless one. Limit Texas Hold ‘Em places a cap on what can be bet, to enable no impulsive betting, and to ensure everyone bets a minimum at all stages. Limit is the most popular form of the game as it is easier to monitor and gives the more strategic players time to consider a strategy for their hands, as well as the bluffing of their opponents. Online variations for Texas Hold ‘Em include a live dealer version, which sees a dealer added to the mix to further the pressure and force players to focus more. The live streaming technology may be simple in this case but the reliance on the newest innovations gives a little insight into the potential future of Texas Hold ‘Em. As gaming online and on consoles improves, we could see VR and AR technology being added to online poker, as well as 3D gameplay. The basics of the game will remain but the way audiences can connect with it will be modernized. Omaha Hi-Lo is another variant of poker that takes similar rules to Texas Hold ‘Em but throws most out of the window. For example, the two pair, which often wins in Hold ‘Em, rarely wins in Omaha Hi-Lo, while straights and flushes are a lot more common. The game differs in the four cards that players have to work with; Omaha Hi-Lo players must use the two cards, which takes away some of the combinations of shared and hole cards that Hold ‘Em benefits from. The five card hand must also take some of the shared cards. The best high and best low hand win the pot (it’s a scoop if it’s the same person), which means the action can sometimes be greater with more players and more in the pot. The games both rely on the strategic thinking that poker depends upon, but the intricacies and complexities differ. While Omaha Hi-Lo retains some popularity, Texas Hold ‘Em has far more flexibility and brings the element of surprise through the way the winning hand can be formed. Texas Hold ‘Em is one of the more popular card games. Whether this comes from the community card nature of the shared cards in the middle, from the many chances of betting throughout the game, or from the strategy involved in both analyzing your own hand and your opponent. The game left its mark on the world stage and doesn’t look set to be changing or moving. Texas Hold ‘Em is here to stay, it’s thrown down the gauntlet in a showdown, and gone all in.